Q: How can I get to Tateyama Kurobe Alpine Route? The only public transportation available to go to the Tateyama Station, the beginning point of the alpine route, from the Toyama station is a local railway called "Toyama Chiho Railway as know as Chitetsu". It takes approximately 65 minutes by taking "Tateyama line". You could also drive up to the Tateyama station. However, personal vehicles are prohibited on the alpine route so you must park your vehicle around the Tateyama station. Please refer to the link below for more information. Also, guide pamphlet of the alpine route is available from the link bellow bottom for download. Q: How can I buy a ticket to Tateyama Kurobe Alpine Route? A: There are 3 ways to buy a ticket to the alpine route. 1) Purchasing "a ticket sold on the day" at a ticket counter located in the Dentetsu Toyama Station is the most simple and easy way. Because the most of the tickets are sold as "a ticket sold on the day" and they adopt their sales policy as "first come, first serve", this simple way works really well if you could get up early in the morning such as 6am or earlier. 2) If the alpine route is already on your Japan trip agenda, booking a ticket online is the best way to purchase it. Please note that you could only make a reservation from the midnight (00:00)(JST +9:00hours) the 30 days prior to boarding date until 23:59pm(JST +9:00hours) 2 days prior to boarding date. Please refer to the link below for more information. 3) There is a special-priced ticket called "Tateyama Kurobe Option Ticket" available only for international visitors with a JR-Pass. Please refer to the link below bottom for more information. Q: Should I reserve a ticket for Kurobe Gorge Railway? Yes. To make your trip more fulfilling, making a reservation is highly suggested, because it takes approximately 1 hour by car and an hour and a half to more than 2 hours by train to get to the Unazuki station, the starting point of the railway. Please refer to the link below for more information, timetables, ticket and fare. Q: How can I get to Gokayama and Shirakawa-go? The most easy way to get to the UNESCO World Heritage Site Gokayama Historic Village and Shirakawa-go is the Workd Heritage Bus. You could take the bus from either Takaoka Station (the station only for conventional Railway "Ainokaze-Toyama Tetsudo") or Shin-Takaoka Station (the station only for JR Shinkansen). If you would like to go directly to Shirakawa-go from Toyama station, an Express Bus operated by Nohi Bus is highly recommended. *Click the links below for more details and a time table for each bus line! Q: What is special about Toyama bay? Q: When is the best time to see cherry blossoms in Toyama? Toyama's cherry blossoms bloom between the end of March and the beginning of April. The peak bloom period depends on the place and climate. To know the best time to see the cherry blossoms in Toyama, please go to a blooming forecast website provided by JNTO from the link below! (Unfortunately, the forecast for the cherry blossoms in Toyama is not available from the website, but it can be said that it is really similar to the forecast for Kanazawa.) 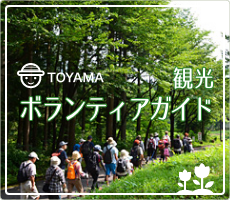 For viewing spots in Toyama, please click the another link below. 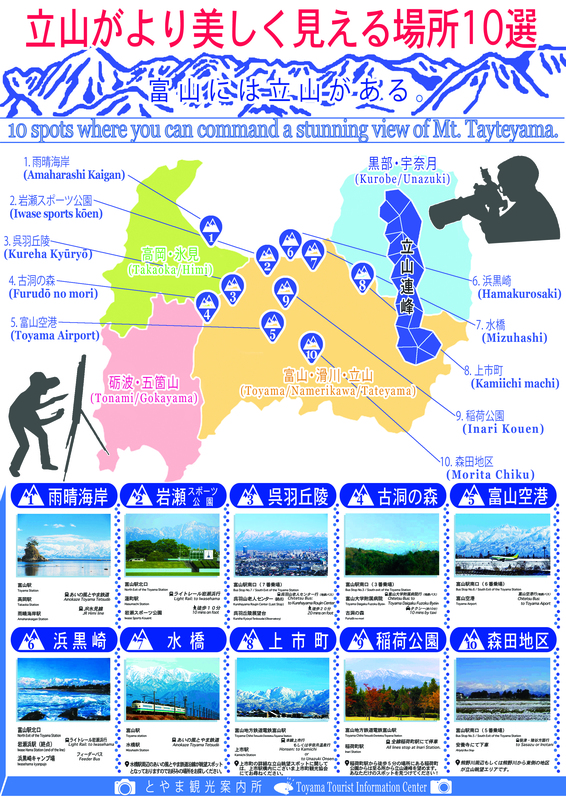 Q: Where is the best spot to view Tateyama Mountain Range? from almost every place in Toyama City. *Click the link below to download a detailed map of the viewing spots! Copyright © TOYAMA-CITY KANKOU ASSOCIATION. All Rights Reserved.